Hi there! Welcome to this guide to choosing the best Bitcoin mining software. In this article, I’ll be looking at five of the best pieces of software to use to mine Bitcoin. I’ll compare each Bitcoin miner software’s various features and by the end of it you should have a good idea about which software is going to be the best one for you. Of course, the best Bitcoin mining software will depend on a lot of different things. It’s important to think about the type of operating system you are running (Bitcoin mining software windows 10 can be very different to Mac OS programs), the level of expertise you have on a computer, and whether you want to mine Bitcoin exclusively. That’s because some Bitcoin mining software lets you switch the cryptocurrency you’re mining from time to time and some even let you mine two currencies at the same time! During the guide, I’ll start with a brief introduction about what we mean by cryptocurrency mining. I’ll then move onto a short discussion about the various goals of a crypto miner and how this will impact their choice of Bitcoin miner software. Then, I’ll get onto the main part of the guide – comparing the best Bitcoin mining software available. This section will include a bit of useful information about five of the top pieces of software around today for mining Bitcoin. I’ll cover: MultiMiner, CGMiner, BFGMiner, EasyMiner, and BitMinter. The guide will give a brief overview of each of these pieces of Bitcoin miner software. I’ll also try to give a scenario or user that each one is best-suited for. Finally, the guide will conclude with a comparison table so that you can look at some of the specifications of each program in the clearest possible way. There’ll also be a link to download each piece of software from too! As usual, I’ve a whole lot to get through in this guide. So, let’s not waste any more time! 1 What is Cryptocurrency Mining? Before we start to look at the various Bitcoin mining software available today, I should begin with a brief lesson all about cryptocurrency mining. The role of cryptocurrency mining is to verify transactions taking place on a cryptocurrency network. To do this in a way that is secure enough on a network like Bitcoin’s network, computer systems must guess a string of characters called a hash. This process of guessing is also known as “Proof of Work”. Proof of Work is what secures the network. Clearly, it is quite a robust security method too since there has never been a successful attack or security breach on the Bitcoin network in its nine years of existence. With a network that’s valued in the billions of dollars, security is of course vital! Cryptocurrency mining can be performed with a variety of different pieces of hardware. These include CPUs (central processing units), GPUs (graphical processing units), and ASICs (application-specific integrated circuits). Each of these can perform a certain number of guesses at the hash in a given time. This is called the hashrate of the hardware. CPUs typically offer the lowest hashrate (fewer guesses per second). Meanwhile, ASICs offer the highest hashrate. GPUs fall somewhere in the middle. However, ASICs are by far the most expensive cryptocurrency mining units both to buy in the first place, and to keep running. They require a lot of electricity! Back in the good old days of Bitcoin, CPUs were easily powerful enough to mine Bitcoin. However, now that mining cryptocurrency has become more popular, the competition is much too great for CPUs or even GPUs to profitably mine of the Bitcoin network. As a result, Bitcoin mining is exclusively performed by ASIC devices these days. 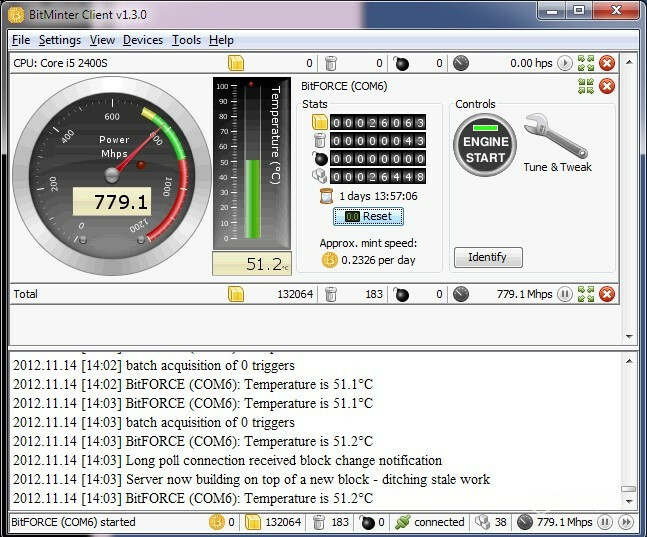 Mining software is used by a computer to interact with mining hardware. It controls the various devices you have. It will direct them to mine as part of a specific pool, change the speed of the fans, change which currency to mine – all the good stuff! Ultimately, the best Bitcoin mining software for you will depend on a few factors. Firstly, of course, do you want to mine Bitcoin exclusively, or altcoins too? Next, what different pieces of hardware do you possess. Finally, do you have a lot of skill using command prompts to run programs, or would you rather use a graphical user interface – also known as a nice-looking program with conveniently labelled buttons to click and so on! For the purposes of this article, I’m going to presume that you are just wanting to mine Bitcoin. Therefore, you’ll probably already have a purpose-built piece of mining hardware (ASIC). Examples of these include the Antminer S9 from Bitmain, the Avalon6, and the Bitfury B8. These pieces of hardware built to mine Bitcoin can also be used to mine other cryptocurrencies such as Digibyte and Peercoin. In fact, they can mine any cryptocurrency that uses a SHA256 algorithm. There are different ASICs that have been designed for other algorithms too. For example, Litecoin and DOGE must be mined using specific ASIC mining hardware. However, this article isn’t about hardware or other cryptos. It’s all about the best Bitcoin mining software! With that in mind, let’s get down to business. The MultiMiner software is a graphical user interface (GUI) based piece of mining software that has been developed as a piece of Windows 10 Bitcoin mining software. It’s possible to use it with Linux or MacOS but this will require additional software. 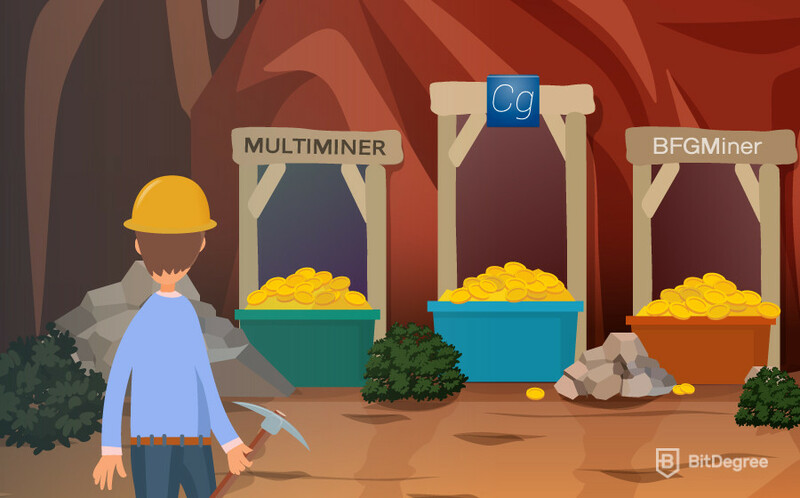 Thanks to its graphical interface, the MultiMiner is many a novice miners’ favourite piece of mining software. It’s essentially the BFG Miner only with a more user-friendly frontend. Being based on this software, it also has some great advanced features too. Everything is made simple when using the MultiMiner software. After you’ve successfully installed the program, MultiMiner instructs you on how exactly to connect to a pool. This includes telling you when to enter each piece of information associated with the mining pool you will be using. What’s more, all the potentially complicated terms are conveniently explained. For these reasons I can confidently recommend MultiMiner to the most inexperienced of cryptocurrency miners around. After you’ve been guided through the setup process, MultiMiner then scans for hardware. It will list each device’s details that it’s able to pick up. Examples of these details include: average hashing power of a device and the pool that it’s connected to. In addition, the projected profits that you can generate will also be displayed. 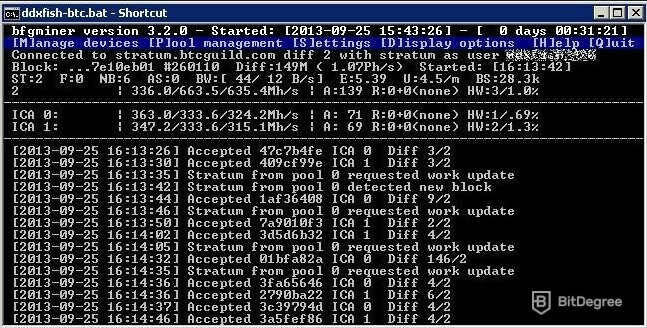 MultiMiner is also capable of connecting to numerous pools at once too. There’s even the option to have the device automatically mine the most profitable coin at any given time or to target those which offer the lowest difficulty. The software is entirely free but there is the option to send 1% of mining profits directly to the developer. This is entirely voluntary, and you could even decide to send profits for a week or a month and then disable the donation. It’s completely up to you! MultiMiner is for you? Download the latest release here. One of the most commonly used pieces of Bitcoin mining software is the Linux-based CGMiner. It has been around for a long time now (almost six years). It has also been coded entirely in the programming language C. This means it’s compatible with almost all operating systems. It’s also based on the code for the early popular mining software CPUMiner. 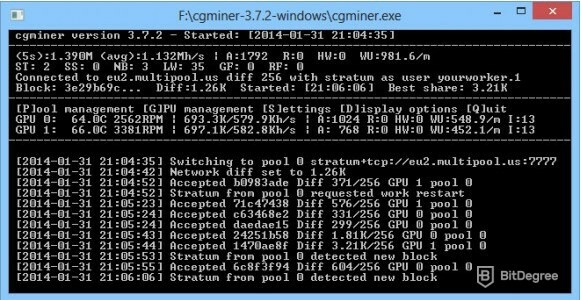 The CGMiner uses a command line interface and supports various mining pools and devices. That said, it is quite a user-friendly command line interface. It uses simple keyboard commands to change settings such as the fan speed amongst others. However, since it offers no graphical user interface, it’s probably a piece of Bitcoin mining software that is best saved for advanced users. Although CGMiner has been largely designed to be used with hardware mining devices you can use GPUs and even CPUs with it too. Despite the fact I said that it is compatible with most operating systems, the CGMiner is rather tricky to install on Windows 10 machines. Various antivirus software will try to block the download, and Windows Defender will also give users a hard time too. If you’re not afraid of a black screen with lots of seemingly incomprehensible text running across it, the CGMiner might be the one for you. You can download it here. If the above image makes you feel uneasy, perhaps graphical user interface (GUI) piece of Bitcoin mining software is a better choice for you! The BFGMiner is very similar to the CGMiner. However, rather than supporting GPUs and CPUs, it has been designed for use with application-specific integrated circuits (ASICs). This makes it ideal for mining Bitcoin or other cryptocurrencies that are not ASIC resistant. It’s also great for any currency that uses a SHA256 mining algorithm. If that phrase confuses you, just think of it like “Bitcoin-based cryptocurrency”. The BFGMiner is available for both Windows, Mac, and Linux operating systems. The software also allows for great customisation of mining hardware. This includes overclocking, using a remote interface, and controlling fan speeds when needed. Users can use the BFGMiner to connect to multiple mining pools and it will even stop connecting to pools that are unreachable for whatever reason. This will save on electricity costs and means that miners won’t be wasting money when the software can’t interact with a pool to generate profit. Like the CGMiner, the BFG Miner might be completely text based but it has been designed with user-friendliness in mind. It’s very intuitive and the use of hotkeys makes performing certain functions both quick and easy. That said, it’s still not suitable for those who have little or no experience using command prompts. If you want to choose the BFGMiner as your piece of Bitcoin mining software, you can get it here. Like most, it’s a piece of free Bitcoin mining software and it’ is completely open source too! The above picture is the BFGMiner working its magic. Exciting, isn’t it? EasyMiner is another great piece of software. Like MultiMiner, EasyMiner has a user-friendly GUI. It serves as a fronted for both the CGMiner and CPUMiner. EasyMiner automatically enters a “MoneyMaker” mode the first time it’s loaded up. This instantly creates a Litecoin wallet and begins mining using your machine’s CPU on a private pool. This is more of a demonstration of user-friendliness than a way to make money. The current difficulty of mining Litecoin means that it’s unlikely to generate profits. As you’d expect from Bitcoin mining software with a GUI, the dashboard of EasyMiner has been laid out in a way that makes it simple to navigate. You can change which mining pool you’re using, alter network settings, and view your crypto wallets all with a single click. Although it’s well-suited for CPU and GPU use, EasyMiner can also mine cryptos using more advanced hardware. Those users who are looking for a simple program to work with an ASIC unit will be impressed by it. EasyMiner can run both CGMiner and CPUMiner at the same time. This means your CPU or GPU will focus on Litecoin, and your ASIC (if you have one) will focus on mining Bitcoin. Unfortunately, there does seem to be issues when using EasyMiner with Windows 10. Certain antivirus programs will remove the files associated with it. This is because it resembles a malicious program that can be installed on a computer without a user’s knowledge. This malware, as it is known, can then mine cryptocurrency for the hacker who created it. If you think EasyMiner is the best piece of Bitcoin mining software for you, you can get it from the following link. If you were looking for free Bitcoin mining software, you’re in luck! Oh, and it’s totally open source too! Next in our rundown of Bitcoin mining software is BitMinter. This software uses a specific mining pool that conveniently has the same name. It’s very easy to setup and the service prides itself on making Bitcoin mining straightforward and giving “high pay-outs”. BitMinter has support for all major operating systems – Windows, Mac OS, Linux. Since it is designed for use with its own pool, the process of setting it up is very fast too. As soon as you sign up with the pool and install the software, you’re pretty much good to go! The software itself is entirely free. However, the BitMinter pool does charge 1% as a commission for mining with them. This is one of the lower mining pool fees around though. It’s particularly low when you consider that the likes of BTC.com charge a massive 4%! If you’re convinced and want to give BitMinter and its one stop solution to Bitcoin mining a try, you can download the client here. Here’s the BitMinter client in all its glory! How cool does it look with its speedometer-type power gauge!? Below, I’ve included a comparison table of the five pieces of Bitcoin mining software I’ve covered above. This should give you a quick and easy reference chart to compare each of the different programs. Hopefully, you can use it to decide which is right for you. Cost Free Free Free Free (1% optional donation) Free to download, 1% to use the BitMinter pool. Well that’s it! That’s the guide to the top pieces of Bitcoin mining software available today. I hope you learned something from it. Ultimately, the best piece of mining software for you will depend on your unique circumstances. This will include which hardware you’re using, which operating system you plan to use the software with, and your level of expertise when it comes to computers. Do you need Bitcoin mining software Windows 10, or do you use a different operating system? How skilled are you at using a computer? Does the thought of command prompts scare the living daylights out of you? Are you looking for free Bitcoin mining software that you can use with a low mining fee? What kind of hardware are you using – ASIC, GPU, CPU? The answers to these questions, along with this helpful guide should aid you in deciding which piece of Bitcoin mining software to use. Need some advice on choosing the Bitcoin mining hardware? Check out my top pics here. So, that’s all I’ve time for on this topic today. With all your new information, what do you think? Is there a piece of Bitcoin mining software that you think is the best? We’d love to hear your thoughts on the subject! Electroneum Mining: How to Mine Electroneum? 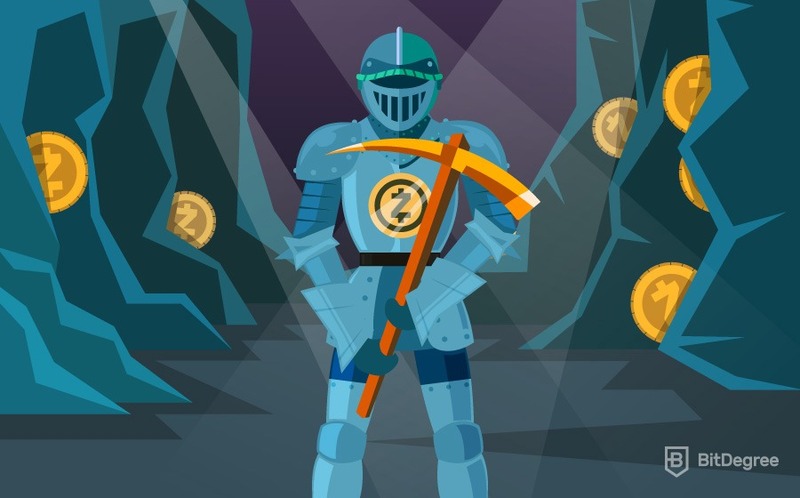 Zcash Mining: How to Mine Zcash?